Primera Warranty: Your unit ships with 1 years return to base warranty as standard. The 2nd year warranty covers parts only (excluding optical drives). To qualify your Primera unit must be registered on the Primera Europe website. Included Ink: This product ships with a full set of original equipment manufacturers ink. Ensuring you are up and running straight out of the box. 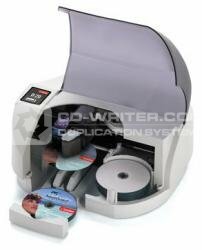 Disc Publisher SE3 on USB3 is a new, fast, "all-in-one" disc publishing system and DVD duplicator. It combines fast, automated robotic CD / BD / DVD duplication along with full-color, 4800 dpi direct-to-disc printing - all in one compact, desktop unit. Disc Publisher SE3 is ideal for producing either one at a time, unique discs or jobs of up to 20 discs at a time. Models include both Windows-based PC and Mac duplication software. Now, there is. It’s the SE Disc Publisher from Primera. Disc Publisher SE is a compact, all-in-one automated disc production factory that fits right on your desktop. It produces full-color, high-quality discs that make your business or organization look truly professional. Disc Publisher SE takes the complex task of burning and printing discs and makes it simple. It uses Primera’s sixth-generation robotics, ensuring reliable and efficient operation. 1. Disc Publisher SE’s robot arm picks a blank disc from the input bin. Disc Publisher SE does all of the work for you – unattended and automatically. It saves you time and money on every disc you produce! Disc Publisher SE is perfect for a wide variety of light- to medium-duty disc publishing jobs. You can burn and print individual discs with unique data or quantities of the same disc. Just a few of the most popular applications include video and music content, software, press kits, trade show handouts, instruction and training manuals, technical documentation, PowerPoint presentations, catalogs – the possibilities are almost endless! From initial set-up to full operation, Disc Publisher SE is easy to use. PTPublisher professional burning software is included for Windows and Mac users. Both burning software packages allow virtually any digital information to be duplicated. View software tutorials. You can use virtually any printable-surface DVD-R or CD-R media. For ultimate performance, try TuffCoat Extreme™ Media surface (glossy finish). Both are highly water-resistant and produce the most professional-looking discs you’ve ever seen! If you only need to print, the Disc Publisher SE AutoPrinter produces gorgeous, full-color discs in jobs of up to 20 discs at a time. It’s the perfect, low-cost automated printing solution for the tower-style duplicator that you may already own. Primera offers professional-grade disc publishing systems for Blu-ray Disc Media with its Disc Publisher SE Blu Disc Publisher. Ideal for developers of PlayStation3 game software as well as high-definition video production, the Disc Publisher SE Blu system works automatically and "hands-free." Using precision computer-controlled robotics, discs are transported into the integrated Pioneer CD-R, DVD-R, BD-R SL & DL recordable drive. Then, each disc is individually printed in brilliant, high-resolution color at up to 4800 dpi. Disc Publisher SE is the most affordable automated CD / BD / DVD disc publisher ever produced, providing you with highly professional results at a more affordable price. Primera distributes its products in more than 80 countries and manufactures more automated disc publishers than any other company in the world. You can be confident that you’re in good company when you buy Primera! See the Disc Publisher SE in action! This product comes with a full set of inks. Call us now for more information on 020 8293 0777. Hands-Free Production of CDs / DVDs Have you ever had to burn discs one at a time and then manually print and apply sticky labels? If so, you know how much time and effort is involved. Even ordering discs from an outside vendor takes too much time and is too expensive. You've probably thought to yourself, There has to be a better way! Now, there is. It’s the new Disc Publisher™ SE3 Disc Publisher from Primera. Disc Publisher SE3 is a compact, all-in-one automated disc production factory that fits right on your desktop. It produces full-color, high-quality discs that make your business or organization look truly professional. Advanced Robotics Disc Publisher SE takes the complex task of burning and printing discs and makes it simple. It uses Primera’s sixth-generation robotics, ensuring reliable and efficient operation. Here’s how the process works: 1. Disc Publisher SE’s robot arm picks a blank disc from the input bin. 2. The disc is placed into the integrated recorder. 3. The disc is burned. 4. The robot moves the disc to the built-in, 4800 dpi direct-to-disc inkjet color printer. 5. The disc is printed. 6. The robot picks the disc from the printer, places it into the output bin and starts over again. Disc Publisher SE does all of the work for you – unattended and automatically. It saves you time and money on every disc you produce! Many Applications Disc Publisher SE is perfect for a wide variety of light- to medium-duty disc publishing jobs. You can burn and print individual discs with unique data or quantities of the same disc. Just a few of the most popular applications include video and music content, software, press kits, trade show handouts, instruction and training manuals, technical documentation, PowerPoint® presentations, catalogs – the possibilities are almost endless! Simple Installation and Operation Easy-to-use software is included for both Windows and Mac PCs. Installation is fast and easy, too. Just connect one cable, install one print cartridge and load one software program. You’ll be automatically burning and printing discs in minutes. Robust, Water-Resistant Media You can use virtually any printable-surface DVD±R or CD-R media. For ultimate performance, try Primera’s new TuffCoat™ with AquaGuard™ surface (matte finish) or TuffCoat with WaterShield™ surface (glossy finish). Both are highly water-resistant and produce the most professional-looking discs you’ve ever seen! AutoPrinter Model Also Available If you only need to print, the Disc Publisher SE AutoPrinter produces gorgeous, full-color discs in jobs of up to 20 discs at a time. It’s the perfect, low-cost automated printing solution for the tower-style duplicator that you may already own. Using precision computer-controlled robotics, discs are transported into the integrated Panasonic® CD-R, DVD±R,SL & DL recordable drive. Then, each disc is individually printed in brilliant, high-resolution color at up to 4800 dpi. The Price/Performance Leader Disc Publisher SE is the most affordable automated CD / DVD disc publisher ever produced, providing you with highly professional results at a new, more affordable price. Primera distributes its products in more than 80 countries and manufactures more automated disc publishers than any other company in the world. You can be confident that you’re in good company when you buy Primera! The 2nd year labour/hardware warranty is subject to registration with Primera Europe and fulfilled by Primera Germany directly. The Bravo SE is the perfect tool for desktop disc production. Ideal for many applications where lower volumes of discs need to be produced. Disc . Publisher . SE . + . 2 . Year . Warranty . Primera .